I have eight articles currently, the History of Music, the History of Midi, the History of my Musical Creations, the History of my BBC Micro Music, a Brief History of the Single, Technology and Media in 1996, Autographs and Tomorrow's World - The Jam Spreading Myth. I started creating music with keyboards many years ago when I was in school, which meant I had access to the school's keyboards as well. 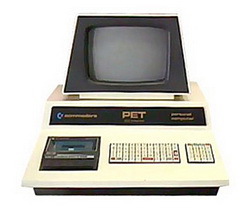 I started using computers when I joined the computer club, which was a small room near the top of the school with a couple of Commodore Pet computers. 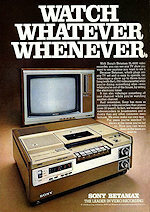 These had a built in tape drive to save and load programs, but didn't really have any music capabilities. By plugging some circuitry onto some pins at the back of the computer and connecting them to a speaker meant by some clever programming you coud produce some musical tones. I remember using a Casio VL-Tone to tune the notes and then creating some very basic songs with the 8K available at the time. Eventually the computer room was moved and updated and the school bought several BBC Micros, which plugged into a black and white television. We also had a few colour monitors as well. I recall the first day the room was open and the computers had arrived, but not the monitors. As my friends and I had read about the programming available on these machines we typed in simple programs 'blind' to produce noises. 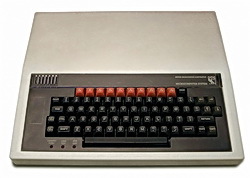 The BBC Micro had four channels of sound, three tones channels and one noise one. Notes could be made using the SOUND command, and the tone could be shaped by the ENVELOPE command. The early programs used an array of data previous worked out, which was read and then played by the computer. 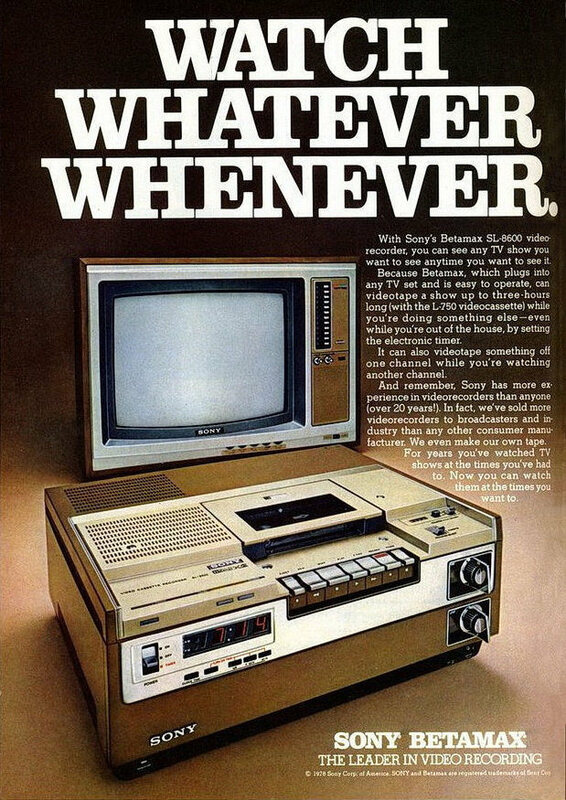 Depending on how much of the 32K of memory was used, you could add graphics to the screen. 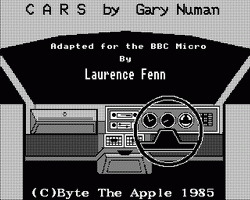 The BBC had several different graphic modes, which used different amounts of memory. To reduce the size of the program, I used to create the graphics using one program and save the drawing commands to a file. Then I could import the commands to draw the graphics withut needing any of the original program. The music playing code was borrowed from another music program, but I wrote to the guy who creted it to get permission to use it in my demos. 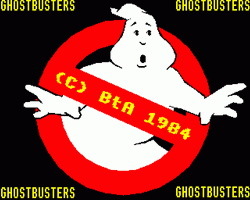 The very first music demo I did was the Ghostbusters theme by Ray Parker Jr. and I copied the Ghosbusters logo from the cover of the single. Program swapping was common place in those days, as there was no internet as such. There were a few bulletin boards which you could dial into and find programs that other people had written, but mostly it was done by physically swapping discs with friends. It was strange that a friend of mine was speaking to someone a few months later who said he has this great demo for the BBC Micro of the Ghostbusters theme and he had to tell the guy that he was friends with the orignal writer of the program (me!). I continued to create these music demos from songs that I liked, and some just played the song with a still picture, or printed the words to the song in time with the music. Creating the music was fairly easy as I play by ear and can pick up a tune quickly. The hard part was finding something to look at when the music played. If I couldn't recreate the cover for the single, like I did for Depeche Mode's Just Can't Get Enough, I would try something else. For my cover of Gary Numan's Cars, I drew the dashboard of a car (which I copied from the manual of my Dad's car at the time). By the time I did a cover of Duran Duran's A View To A Kill, I was able to draw the 007 logo, then have a white circle move across the screen and reveal a James Bond style man. I couldn't get a realistic colour splatter to drip down the screen (I was only using BBC Basic remember) but the end result looked fine to me. Due to the lack of memory available, I sometimes had to use MODE 7 graphics mode, which only used 1KB of video memory, leaving 31KB for the program. The other graphics modes could use up to 20KB of memory, leaving very little room for the program itself, so any method of saving memory was used. Some of the demos played scrolling graphics in a window, or displayed the words to the song in time with the music. Often I would use another program to draw the graphics and save the output to a file. I could then spool the graphics back from the file using one command, saving memory. 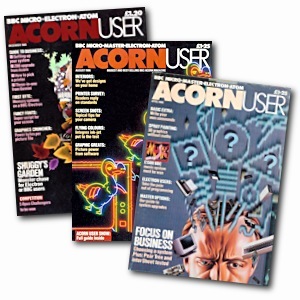 I advertised these demos in a small ad in the back of Acorn User magazine, and I had lots of enquiries for the music, which was divided into four discs initially. The songs ranged from OMD's Locomotion, Yazoo's Only You, Doctor Who, Cars by Gary Numan and Two Tribes by Frankie Goes To Hollywood. I created two more discs and advertised them in later issues of the magzine. These discs were very popular and I eventually did a compillation of the first four discs on a double sided, double density disc. If you search for software to run on any of the excellent BBC Emulators for PC, you will find my disc as a 400K dsd file which you can load. 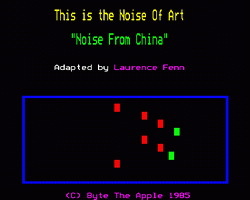 I have seen several references to my discs in forums about music on the BBC Micro. Some sites have been listing disc 6, which is in fact the discs 1-4 compilation and someone else has made their own compilation of some of my music demos and made a bootable disc. Please ignore these downloads as they are incorrect. Thanks to Nigel I have all 6 disc images available, so you can download Disc 1, Disc 2, Disc 3, Disc 4, Disc 5 and Disc 6 (TV Themes). Discs 5 and 6 have not appeared on any BBC Micro website. PC Users can run the discs directly using the JSBeeb Emulator on this site. The links to all the videos are now on their own page.